Not many are aware that it is possible to create Virtual Hard Drive images in Windows 7. Backing up your data is important and this article will detail how to backup data to a Virtual Hard Drive (VHD) or hard drive partition. Creating the Drive is the first step, but the backup is the crucial point. It is best to use an external Hard Drive for backup, but this method can be easily as effective, as this data can be transferred to an external hard drive later. This is an especially useful feature for a network. All data from all computers and devices on a given network can be stored on a Windows 7 VHD. In this way, multiple computers can have their backup on one computer in the network and then all computers on the network can consolidate backups to a single external hard drive backup. This is useful for single PC users as well. First, a quick review of creating a hard drive partition is demonstrated. To begin, go to Start > Right-click Computer > Manage. Or, enter computer into the run and search box and select Computer Management from the available options. Click on Storage > Disk Management. Choose the drive that you want to partition. In this example, there is only one hard drive to choose. It is a 1TB hard drive with an NTFS files system and plenty of space to allow for a significant partition if necessary. Here, the amount of shrink space entered is 100,000 MB, or 100 GB. This is a decent size for a VHD and it can be altered in the future. Click Shrink when done. Select this unallocated space and right-click and choose New Simple Volume. The setup Wizard will appear. 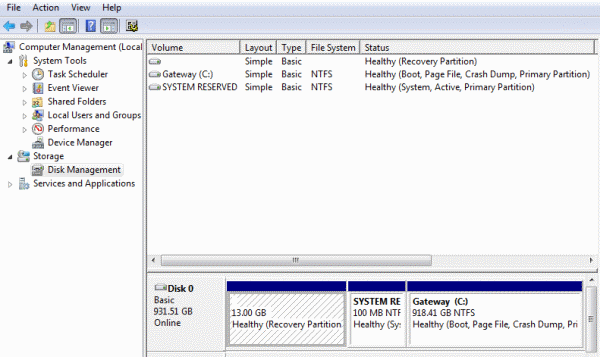 Follow the steps and fill in the partition size. You should see the VHD listed when you double-click Computer. In this example, it is named “Archive”. Now that the VHD image has been created and named, the next step is to choose the data to backup. You may drag and drop as many files as the space will allow. With a partition of this size, a large amount of data can be stored over time. The computer used in this example shares data with other PCs on a remote network. Using Windows 7 Backup and Restore, you can backup all data on the PC easily and save yourself the trouble of dragging and dropping. Select Options in the Check backup settings then click Change Backup Settings and you will see this window representing all drives. Select the new VHD as the backup Volume by clicking on it and then click Next. Notice that Windows 7 warns that this drive is on the physical disk as your system drive. This warning is there because this is not the ideal space for a final backup. It is rather easy to transfer the data from the VHD to an external hard drive at a later time as often as needed. To select specific documents, rather than a full backup, highlight “Let me choose”. To allow a full backup, highlight “Let Windows choose”. You can set a schedule for the backup to occur at regular intervals but always be sure to make a final backup on an external hard drive. On a network this is particularly useful. You can, for example, backup a shared network folder on a weekly basis and ensure that shared network files are continually backed up. Set it any way you like. This isn’t a VHD; a VHD would live on top of an existing formatted partition. In this case, you’ve just created a partition on the drive. This has been possible for years (although shrinking existing partitions has been made much easier). VHD mounted paritions show up as a different color in the disk management console. @vivitron: perhaps you should learn to research a topic before you respond as you did … if you had, you would understand that partitioning a hard disk is vastly different than presenting a raw disk to the OS to be used as storage for virtual hard disks. One of the major benefits of doing that is to eliminate any level of filesystem overhead incurred on the disk, by the system. also, when you are presenting raw disks, you lessen the chance of resource(hard disk) contention by one level in whatever hierarchy they may reside. Hopefully that helps a bit. Its one thing to experience stupid, its something altogether to be forced to watch stupid happen, and have no control over it. Thanks for your article, but I always use Vibosoft Free Data backup for my windows 7, that’s really a great tool, it is free, and easy to use. 3. Completely restore partitions from image files without data loss.